Hi everyone! I'm Andrea and I'm so thrilled to be here at Kim's today. 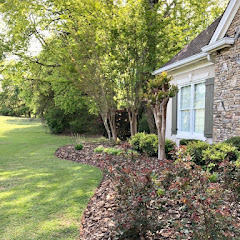 When I first started blogging, Savvy Southern Style was one of the first blogs I started following and I've been hooked ever since. Kim always inspires me and I often wish she would come visit me and help me decorate! Since Kim first asked me to share my favorite room, I've had to think a bit about which room that would be. In the end, I chose our dining room. For one thing, it's one of few rooms in our 80 year old farmhouse that is actually completely finished! 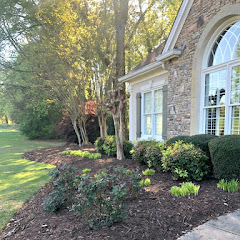 It's also the center room in our home because of our home's foursquare design, which means it connects the living room, master bedroom and kitchen. That means we end up spending a lot of time here. This room also has a few original elements that happen to be my favorite. One of them is the built in cabinet that still has its original hardware and wavy glass. The other is the bead board ceiling, which we painfully restored to its original condition after discovering it underneath cardboard ceiling tiles. When we remodeled in here, I painted the walls white to brighten the room, particularly since the wood ceiling is very dark. I also sewed floor length curtains in this floral pattern to add a little color. Another fun original element is the telephone nook you see on this wall. This room also contains a few items that are very dear to me. The picture hanging above the mantel was painted of my husband and I as a surprise and given to us as a gift. In fact, this painting played a huge role in inspiring the colors for this room since it is so special to us. The fireplace is one of four in our home. I suppose by now you've probably guessed that my decorating style is very simple... I love anything old that has a story and I'm always inspired by elements of nature, particularly for seasonal decorating. The grain-sack stockings hanging below the mantel were a recent gift from my sweet, talented friend, Ann. I was motivated to do a little seasonal decorating for this post and these gorgeous, hand-made stockings arrived at just the perfect time! I brought in a few cypress branches from outside to decorate the mantel with. The leaves are soft and feathery and make me think about all the things I love about this season. Around the corner we have a practically bare wall that I decided not to share (laugh... I am one of those that leaves a wall blank until I find just the perfect piece to fill it) and then the piano. We chose to place the piano here since this room is so large and is the same size as our living room, in fact. It's the first thing you see as you look into the room from the front entrance in the living room. I love decorating with red accents this time of year. I made the sheet music wreath a couple years ago to fill the large space above the piano. And finally, we also have a large freestanding cabinet and hutch. I love the contrast of white and warm wood and it's always fun to add touches of color each season. It's an honor to be sharing one of our rooms here today. Thank you, Kim! Thanks so much, Andrea, for sharing your favorite room with us. I would love to have a farm house to renovate and make mine, but Mr. Savvy thinks I'm crazy. I hope y'all will go check out Andrea's blog, Keeping It Cozy. If you love farm house style you will love her home. If you have missed any of the past "favorite rooms" you can check them out in my guest series tab under my header. Lot's of pretty rooms have been shared. Have a super duper weekend and be sure and come back Saturday night for "A Homespun Christmas" link party. Such a pretty room! I love Andrea's style! I just love her warm and cozy style! There is something magical about an old farmhouse. I love the little stockings hanging on the mantel. In fact, I recently ordered a set from Ann too! Can't wait to get them. Ann is the best! Thanks for sharing her lovely home. I look forward to following her blog. Oh my gosh! Total room envy! Love every single detail!! Totally makes me want to paint our living room a bright white, so every bit of the dark original trim and doors stands out! That ceiling is gorgeous! Thank you so much for sharing with us, Kim! I have to go over and follow Andrea immediately! It's beautiful!! every detail is gorgeous. The stockings are adorable. It's such a beautiful home. Your style is lovely, Andrea! Thank you, Kim for sharing with us! I love her blog and her home. So, so pretty! Andrea has gorgeous style and her home is amazing! Love the contrast of the white walls with that fabulous old floor. I love Andrea's home, and I'm so glad that there are people like her restoring these old houses. You just can't duplicate their character in a new home. That original beadboard ceiling is amazing! Thank you again, Kim, for inviting me to share a room on your lovely blog! And thank you all so much for your kind words. Beautiful, Andrea! You have wonderful taste and such a warm and inviting style. What a pretty room - it gives such a feeling of calm. 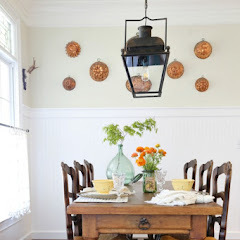 I love the white walls and woodwork - a good choice! Very pretty room...decorated simply and beautifully. Andrea, thanks for sharing this lovely room with us! Lovely!! Andrea, I am struck by how similar your fireplace wall is to one of the walls in the basement of our old house. Our house was built in the 1840s, but the basement appears to have been remodeled in the 1930s or 40s. Your mantel and built-in cabinet are eerily similar to ours. Oh my gosh I got so many new ideas! I love the pine cones hanging from the ribbon. Thanks Kim for featuring Andrea...she is such a genuine and lovely person. See you tomorrow for the party! Andrea's farmhouse is beautiful. She is such a special lady with a wonderful eye for beautiful things. Love every original element in this room!!! So heart warming to see these elements restored and appreciated!!! This is a beautiful room and I love your understated decorating style. We had a very old home we restored a few years ago and it had the built in cabinets in several rooms...oh, how I miss those (I don't miss the windows that were so hard to open)! I love the stockings, love the centerpiece on the table and that ceiling is amazing. Love it! I love your simple, understated, yet very elegant decorating. Your wood ceiling is beautiful and I love the white paneled walls. A gorgeous room! 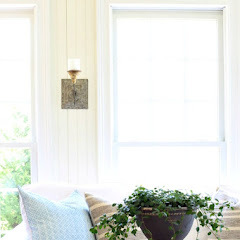 I just love Andrea's home and reading her ever so refreshing blog...her farmhouse is so beautiful and her taste is exquisite....It is no wonder that she was Country Living "lifestyle blog" of the year! !...Congrats again Andrea!! ... and thanks Kim for presenting Andrea's favorite room...it is one of my favorites too!!! That is a beautiful dining room! It would be my fav too! Gorgeous room. Love her style! And I love that it's not over-decorated. It has just the right touch of Christmas. Andrea, your dining room is incredible! This is my true style... an old restored home... great bones and a few beautiful pieces!!! It is a treasure! I'm sure you love that ceiling! I noticed it right away. It really adds so much warmth and character to your room. There is just so much love in this room!!! Thanks Kim! I look forward to this series every week. What a treat to see so many unique and gorgeous rooms! It's so fun to see how people decorate! 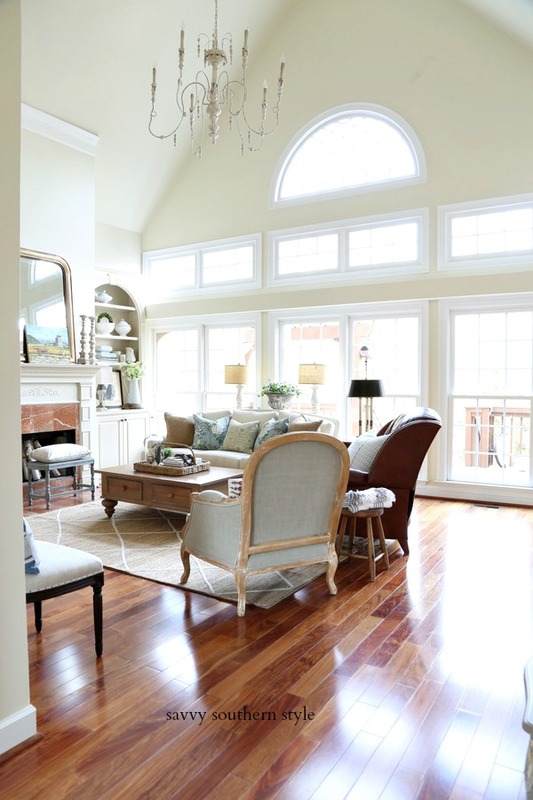 such a lovely room - simple and homey and natural. So inviting , warm and lovely! it really broke my heart to leave it..
Just beautiful! So much charm to it. I love the how the painting inspired the room, that is really sweet. 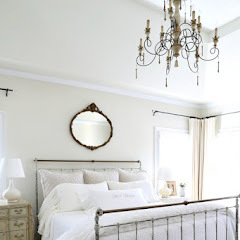 Just beautiful, I love the wreath and this room is very comgy and cozy! What a lovely room. I love her clean simple style. Andrea is such a sweetheart. I love her use of white with wood. i just love andrea's blog and style! tfs!